They're growing, right? They must be growing. Friends tell me they are growing, but they still seem so teeny to me! I should try to get a picture of the Juniors for comparison. 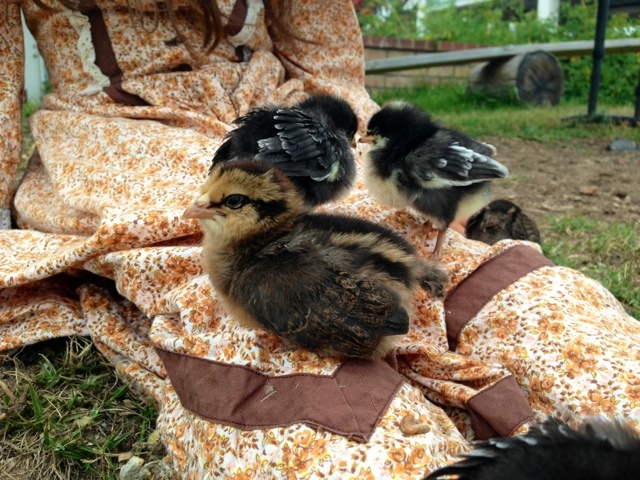 The Juniors have already moved into Camp Whoop-Up with the rest of the chickens, rabbits, and goats. No fuss, no muss. 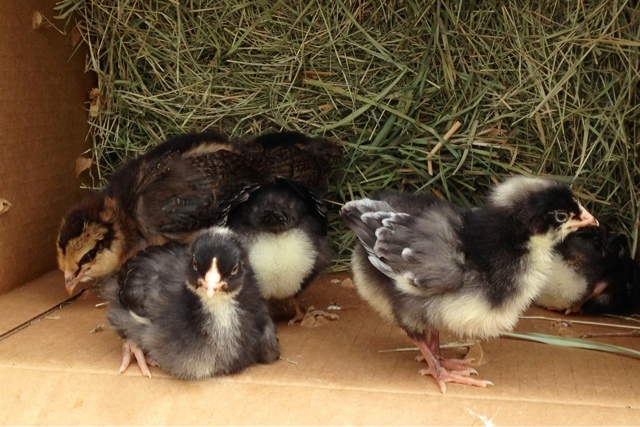 The older chickens were mellow, and the Juniors were happy in the big mix. So, I guess that hurdle is behind us. 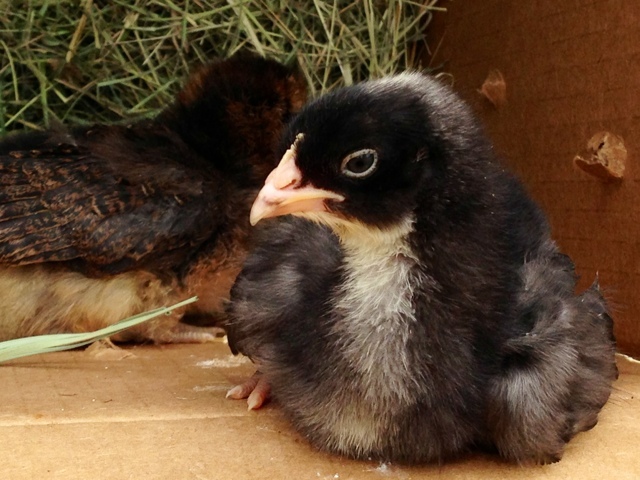 The Cuckoos and the Ameracaunas, the wee ones, still sleep under their heat lamp, and take lots of spontaneous baby naps. They're basically adorable. One moment they are six feathered wind up toys, spinning in every direction, and the next they are like one organism... They hear something, dash toward the same point, and sit as still as can be. They share a sense. The best part is that they know us and like us!! I wish I could say the same for the Juniors, but I'm afraid we came on their scene a bit too late. We'll keep trying, though. 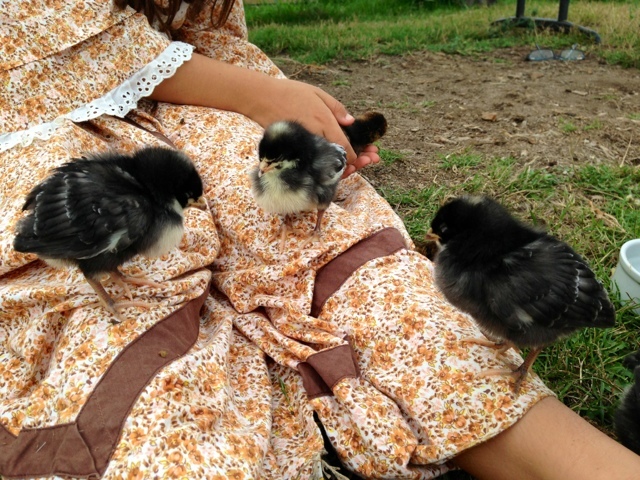 The Chiquitas hop onto our open hands, and clamber up onto our laps. 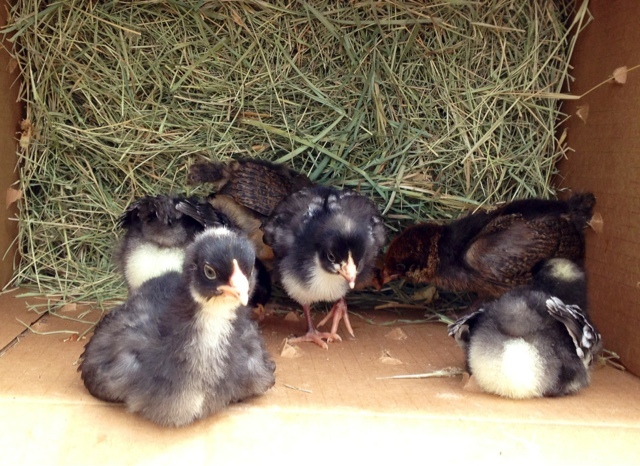 We can hold them, pet them, and even sit as living roosts! Maria had all six of them napping on her extended legs. 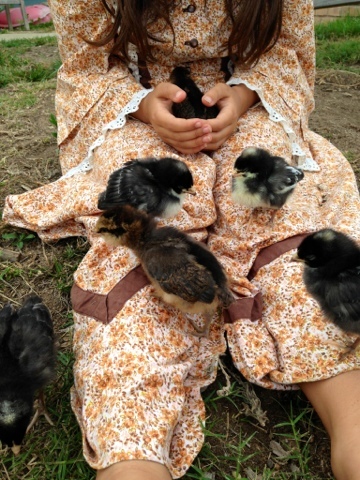 We think they are attracted to the calico print of her dress, which we now fondly refer to as the mother hen dress. & Thomson... Who are hardly distinguishable at all! Oh my gosh! Those chicas are so adorable! And I love the nicknames too; very creative.